As I write this, Hurricane Sandy is still raging, and with so many tragedies and devastating images, the news is overwhelming. 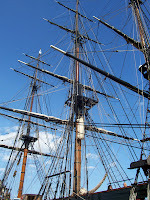 But the one event that stays in my mind is the loss of the HMS Bounty, along with two members of her noble crew. 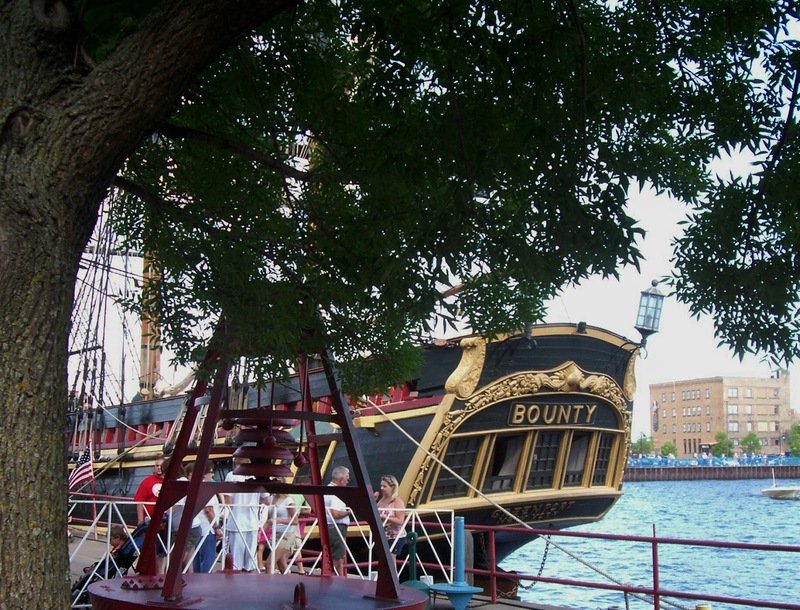 At this time, one body has been recovered and her captain is still missing. 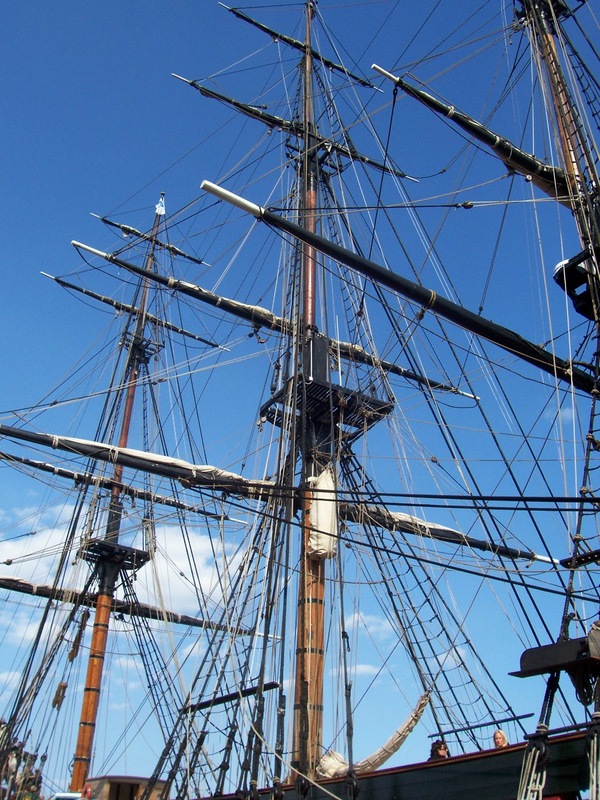 Thankfully, 14 other crew members were rescued by the Coast Guard. The ship herself now rests at the bottom of the sea. Lift Bridge in the background. 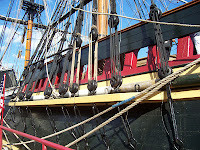 Details of her hull and rigging. 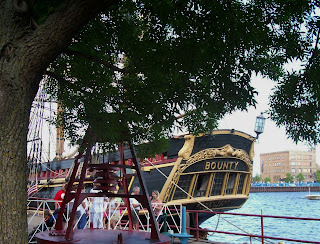 Like millions of others, I had seen this ship in Mutiny on the Bounty, as well as Pirates of the Caribbean. 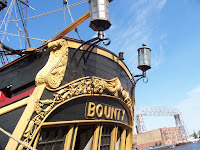 I remember going with my father to see the 1962 release of Mutiny (he was a Navy man and loved anything to do with the sea), and I had recently viewed the film again in preparation for the Duluth trip. So this festival was not only a gift for my wife, it was a piece of nostalgia. 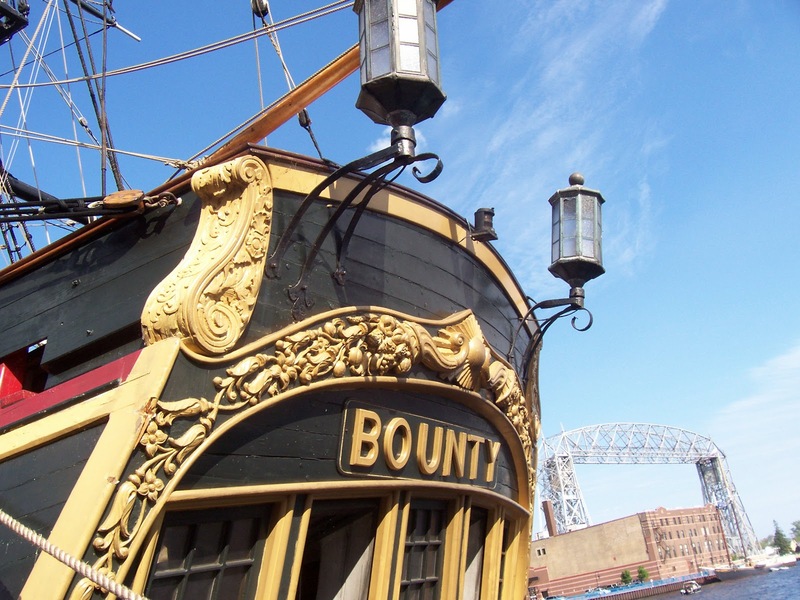 To me, the story of the original Bounty was almost mythological in historical importance. The opportunity to see such an exact replica up close was a real thrill. Little did we know, it would be a once-in-a-lifetime experience, because now she is gone forever. 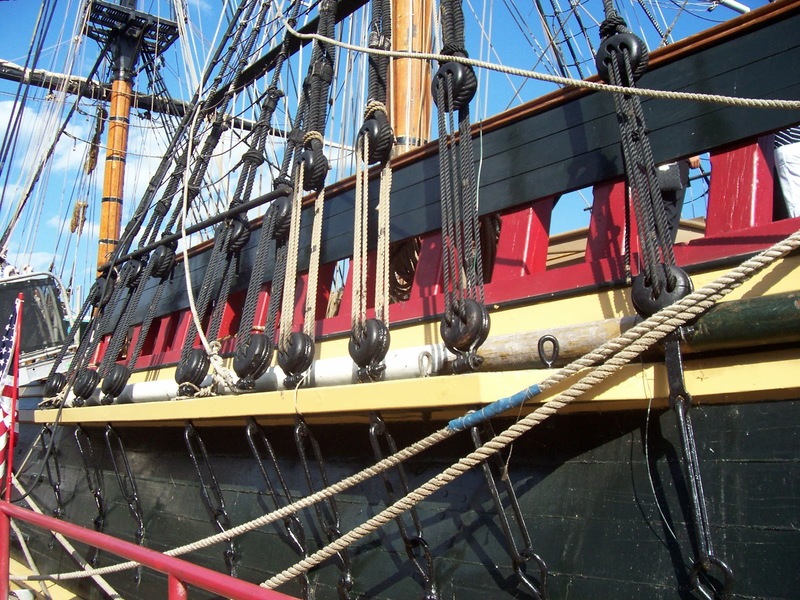 I'm thankful we got to see her, and will always remember that wonderful day among the great tall ships. foreground is a vintage buoy. Why was this hornet's nest so close to the ground? Now that the leaves are all down, you can sometimes spot interesting things that were hidden during the summer. Like this Bald-Faced Hornet's nest that has its opening less than a foot above the ground, which is probably why I couldn't find it earlier in the summer. I knew there were hornets around because I saw them, but I was looking UP into the treetops, where these nests usually are. And here there was a nest less than 30 feet from my chicken coop and practically ON the ground -- not more than six feet from where I was harvesting wild plums! I probably walked past that nest dozens of times and never even knew it was there. I didn't bother them and they didn't bother me. This is the second time I've found a very low nest on my land -- the first was only about 3 feet off the ground, near another outbuilding. 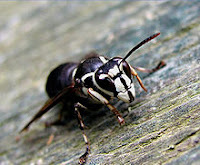 There are plenty of trees around here to nest in, so I am wondering: Do hornets often build so low, or do I have an unusual strain of these insects breeding here? 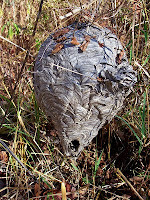 Hornets only use the nest for one season, after which they all die off except the new queens, who hibernate over the winter, producing new colonies in the spring. So it is conceivable that some mutation is causing queens here to nest low. I'll have to watch for more low nests next spring. Before I go any further, I should mention that there is NO HONEY in a nest like this, in spite of what Hollywood might think. In both cartoons and live action films (such as in Doctor Doolittle 2, where a bear climbs up to a nest for honey) hornet's nests are mistakenly confused with old-fashioned garden beehives. Climb up to one of these nests and all you will get is a bunch of stings, because hornets don't make honey. They are predators that feed their larvae on insects. 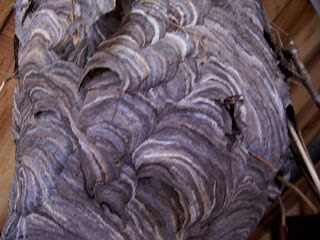 wood fibers for their nest. 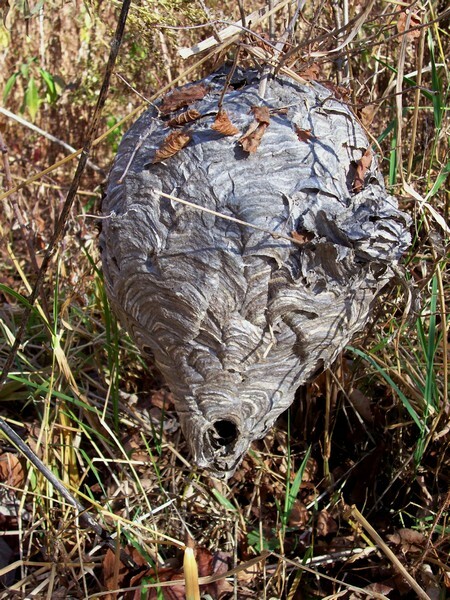 Where were the hornets getting their wood fibers to make this nest? 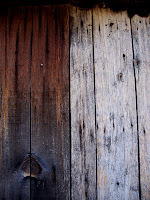 From the back of my chicken coop, where they scraped the bare weathered wood clean. I've seen this behavior here before, both with hornets and wasps, but wasn't paying much attention this summer because of the heat wave. It wasn't until I found the nest that I went to look at the coop. You can very clearly see the lighter areas where they were working (click the pix to enlarge). Interestingly, they seem to follow the vertical lines of the boards. In cases where I have actually seen hornets doing this, they are always clinging vertically, never horizontally. Most likely, they are following the grain of the wood. 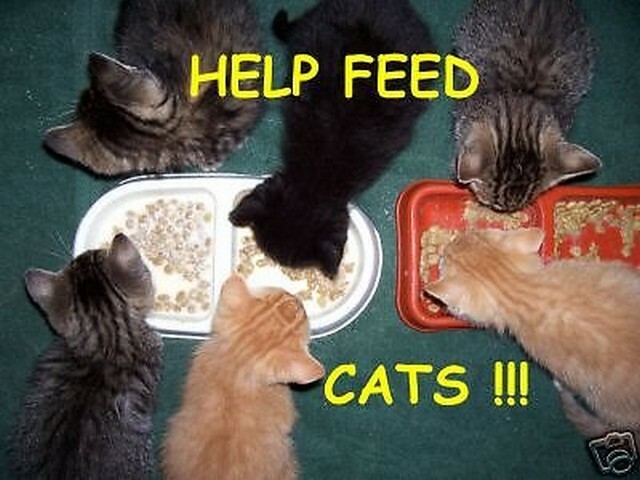 And if you listen very closely, you can actually hear them chewing. In fact, the first time I observed this behavior many years ago, it was by first hearing a strange scraping sound, looking for the source, then seeing a hornet busily chewing along a dead goldenrod stalk. 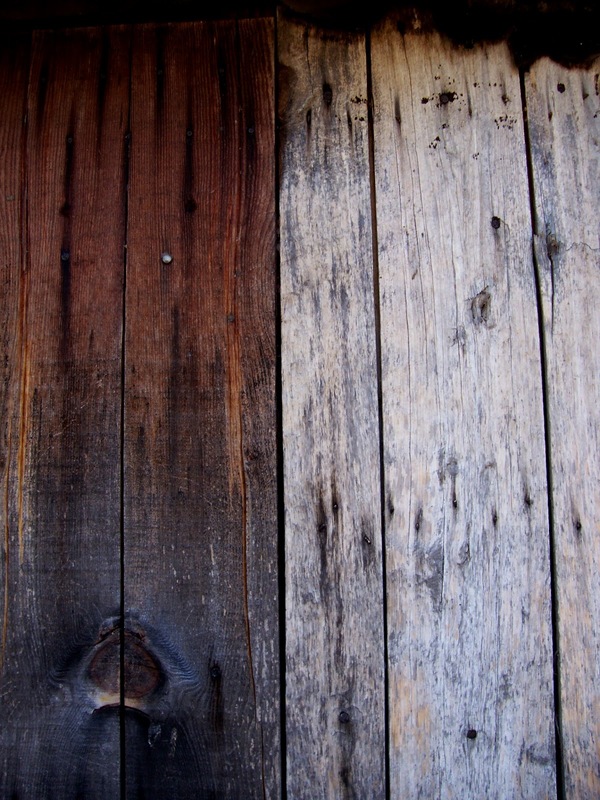 In this closeup, you can clearly see where they left off and the patina of the old wood (darker area on the left) still shows. When you look at the nest itself, you also see variations in the color of the paper, with clear stripes from both the dark and light areas. This suggests to me that each wasp goes back to the same part of the coop wall, gets a load of fibers, then returns to the same area on the nest. But since I have not actually observed this, it is only guesswork. All of this brings up the question of where wasps and hornets get their wood fibers in developed areas. 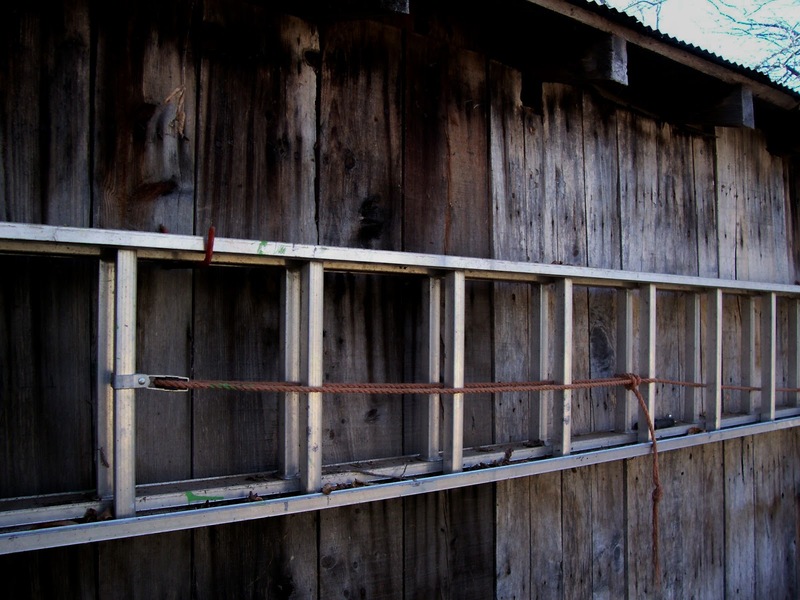 An old weather-worn shack like my chicken coop would never be tolerated in more upscale neighborhoods. Ditto for dead trees and other suitable debris. Maybe they use wooden fences? I have seen photos of nests that are more reddish in color, as if made from redwood. Hornets, along with their cousins, the paper wasps, are very good for the garden -- which is where the inhabitants of this nest were hunting all summer. I watched them searching among the broccoli and cabbage leaves for those little green caterpillars. When they find one, they sting it and carry it back to their nest. Ditto for army worms and other pests, including flies, which can be found in abundance around the coop and manure pile. Plus, both hornets and wasps visit flowers to eat pollen and nectar, and seem to be moving into the niche that has been vacated by honey bees around here. I only saw two honey bees all summer, but lots of wasps were on the flowers, and we got a good harvest. So unless the nests are someplace dangerous to me or my animals, I leave these very beneficial insects alone. Besides, they give me an excellent reason NOT to paint the chicken coop! variations of colors of wood pulp used. 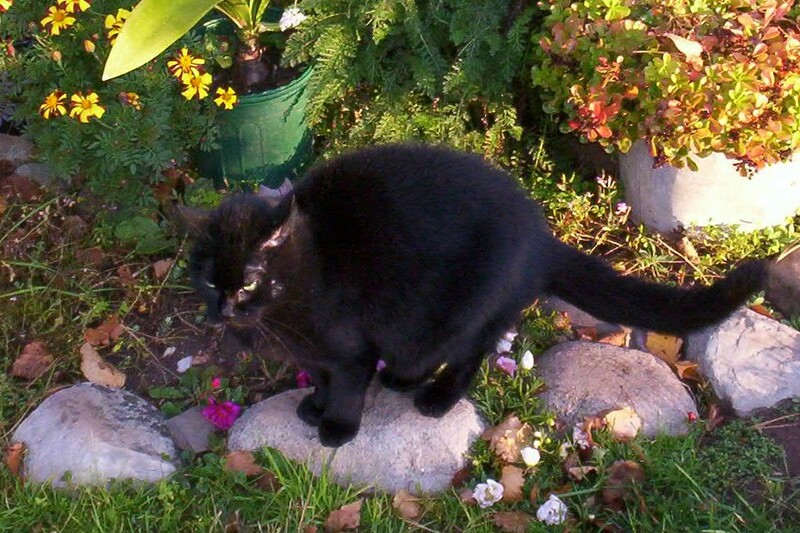 Coolio Cat and Nightshade: Did their love transcend death? 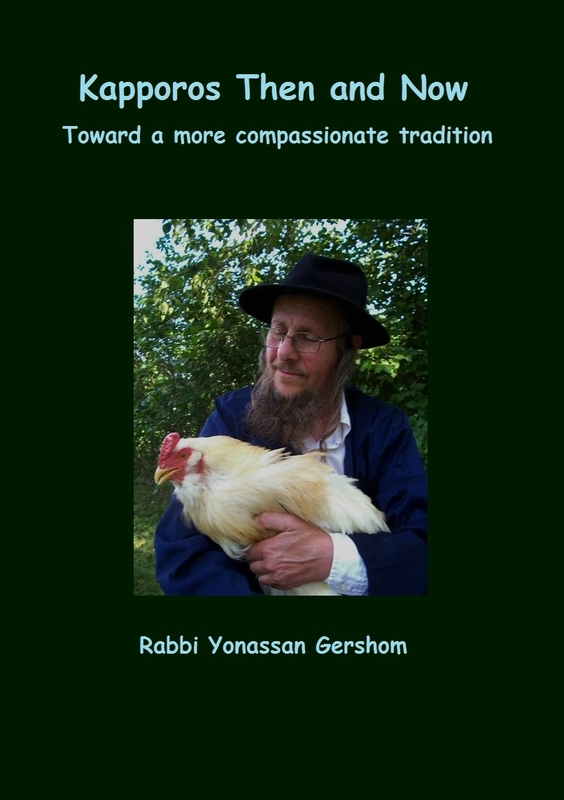 Do bonds of friendship between animals survive death? This is an interesting question that may not be provable with hard evidence, but I believe that, in some cases at least, they do. Nightshade was always an emotionally needy cat. She was a rescue who had a terrible, abusive kittenhood. 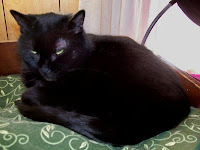 Once we had adopted her, she quickly bonded with us and with Coolio, a young stray cat we took in when we moved here. 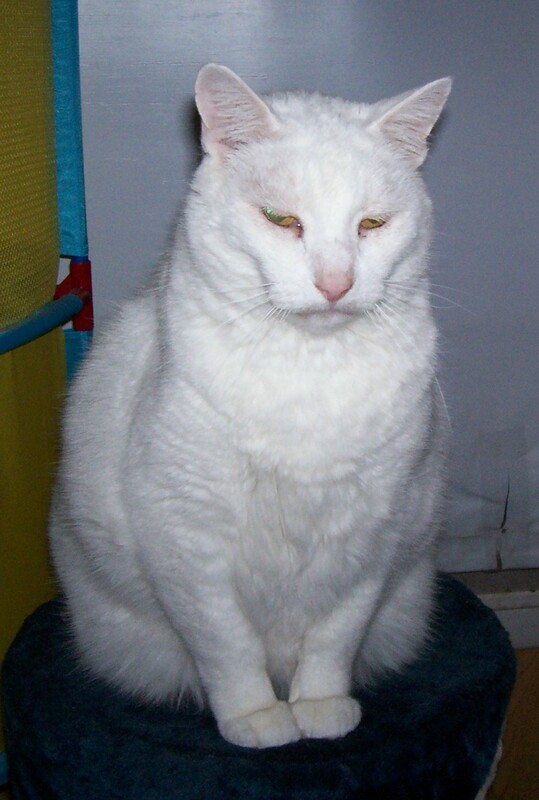 Although Coolio was a year older than she was, he was still young enough to romp and play and teach her how to be a happy cat. 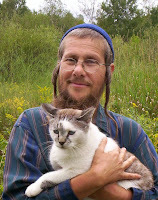 On the other hand, she didn't trust our dogs, and would puff up and hiss if they got too close. It was this habit of rearing up like a Halloween cat, along with her somewhat grumpy facial expression, that earned her the name Nightshade. ﻿﻿﻿﻿After Coolio died, Nightshade became even more clingy. She wanted to be held constantly, and spent a lot more time riding around on my shoulder. Meanwhile, her health took a sudden turn for the worse. She developed breathing problems, ate less, and seemed to have trouble keeping warm. I would often find her sitting on top of the fridge, or next to the crock pot when it was on. She also sat on top of the stove when we were using the oven, and would snuggle against the other cats on the couch. And she spent more time sitting in the sun, where, presumably, her black fur absorbed the warmth like a feline solar heater. On Sunday I buried her next to Coolio -- and here is where things got strange. I dug the hole as usual, lined it with dry grass, and laid her in it, wrapped in a soft blanket. After saying my final goodbyes, I filled in the hole and marked it with rocks. Then suddenly the wind came up, and there was a feeling of light and happiness. For a fleeting moment I had a mental image of Coolio and Nightshade walking together, healthy and happy again. Then it was over. Some might say it was just my imagination, but I am convinced that Coolio's spirit was waiting for her, and that they went together to the spiritual Garden of Eden. Romney is also apparently unaware what a goodwill ambassador Big Bird is around the world. He and his Sesame Street friends enter the living rooms of over 120 million viewers in more than 140 countries. Many of whom, quite frankly, are baffled as to why Romney would attack such a good show -- a show that has won more Emmys than any other children's program. 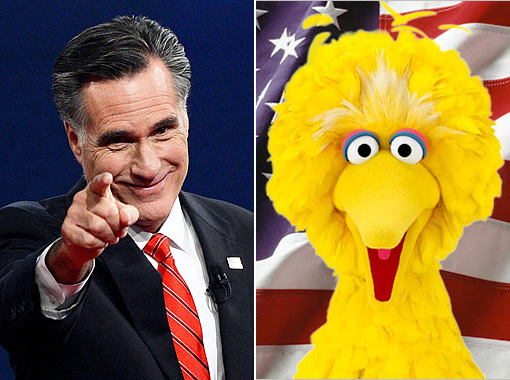 (see the New York Times blog article, Romney's attack on Big Bird sows confusion abroad and feeds it at home ). For many lower-income families, both in America and abroad, PBS is their only access to good, commercial-free, child-safe educational programming. I didn't grow up on Sesame Street (now I'm really showing my age) but my grandchildren have, and I can see the positive effects on their early learning. Which is why the Obama campaign has seized on the PBS issue. It's not just about saving Big Bird (although he has become a symbol of the debate), but about the negative values that Romney holds regarding education. Romney has already said he wants to do away with the Department of Education, as well as eliminate Pell grants, Head Start, and low-interest student loans. He thinks we don't need any more teachers, that everyone can pull themselves up by their own bootstraps, and that if you want to go to college or start a business, you can just borrow the money from your parents. (Which, in my case, would not fund much more than a lemonade stand.) Now he wants to do away with one of the best learning tools we have. ﻿﻿PBS is also a good source of top-of-the-line science and nature programs like Nova and Nature, as well as specials on astronomy, physics, space exploration, evolution, and medical breakthroughs, to name a few. Some of the most amazing hummingbird footage I've ever seen came on the PBS video I got for signing up as a supporter of Nature this year. Of course, you have to believe in the validity of science to appreciate this fine programming -- which may be why Romney's more conservative supporters hate PBS. After all, these are the same people who don't believe in evolution (upon which all our DNA research is based) and want to teach creationism in our schools. 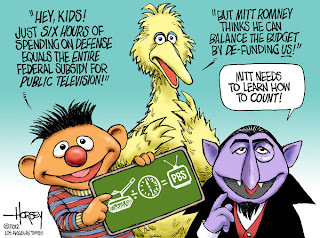 After the debate, Romney said that Big Bird would survive under his administration, but he'll have to have commercials ("look at Corn Flakes" in Romney's words.) Oh yeah -- let PBS become just like all the cable shows, pushing sugary drinks and nutritionless cereals, violent video games, toys the kids don't need, and relying on advertisers' ratings for what shows to include. If Romney really wants to stop the flow of US cash to China, he might start with all those cheap made-in-China toys that break within days or -- even worse -- end up being toxic. One last thought: The cost of a whole year of PBS programming is equal to only six hours of defense spending. Frankly, I'd rather spend my $1.50 to keep on hiring Big Bird.